If you ever want to experience white-knuckle driving… rent a car in Ireland. During our trip we drove 1500km, on the left-hand side, with a manual transmission vehicle, driving down two-lane roads that were about the width of a bicycle path, and fortunately… without having to implement our car insurance policy at the end of the trip. About half way through our excursion, we found ourselves in Dublin. We saw an advertisement for a cooking class and figured, why not?! I wasn’t exactly sure what we would be cooking, but I had to chuckle a bit when the chef handed us the recipes for a 3 course French meal. To be perfectly honest, I was in Ireland, so I was hoping to make a nice shepherd’s pie or soda bread, but at the end of the day, I certainly can’t argue with French food. As I was flipping through the recipes, I came to the Bouillabaisse and thought, uh oh. Mr. HapaNom is not a big seafood person and he is not at all a fan of clams or mussels – “bivalves,” as he calls them. Despite his misgivings, my husband was a good sport and he jumped at my side to be a fantastic sous chef. And wouldn’t you know it, when we all sat down to enjoy our creations, Mr. HapaNom devoured the dish! Even the “bivalves” – exclaiming, “Wow! This is really good”! 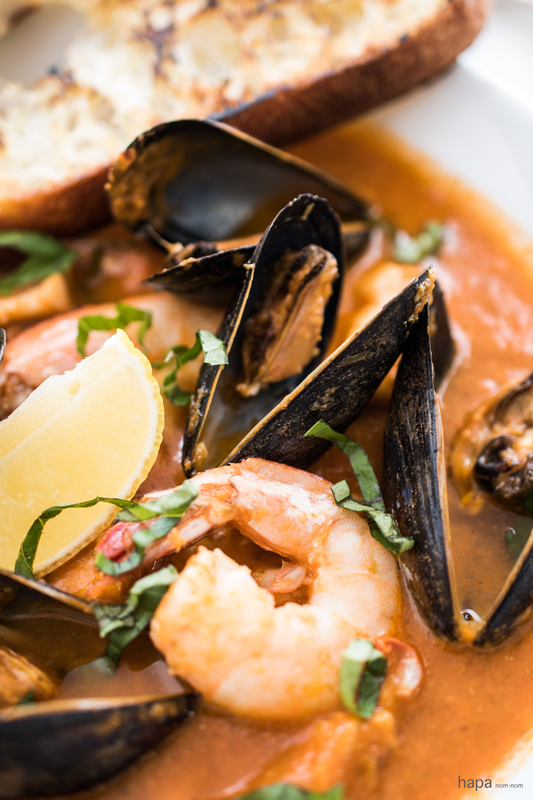 Bouillabaisse is a traditional Provencal fish stew, originating in Marseilles. It’s a dish that was made from what was leftover of the days catch that was not able to be sold at the market. The recipe of course varied widely depending on the fisherman and the days catch; and over time it has developed into an institution of Provencal cooking. 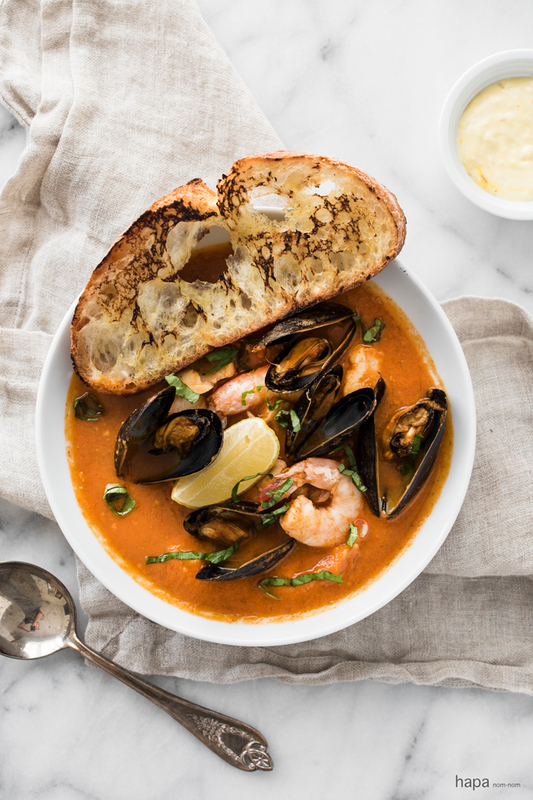 Looking at other recipes, this Easy Bouillabaisse may not satisfy the purists – but it’s not fussy, it’s easy to make, and it’s really good – just ask my husband who scowled at first glance of the menu and later ate every last bit. Aside from the dish being uncomplicated and delicious, I enjoy the fact that this recipe makes use of ingredients that would otherwise be scraps. Such as the use of basil stalks and fennel fronds – items you may otherwise throw away. Then simply use the remaining basil leaves for a nice pesto pasta and the fennel bulb to make a wonderful side salad with orange wedges – there you have it, the following night’s dinner and nothing wasted. Easy Bouillabaisse - Fresh fish, mussels, clams, and shrimp in a rich broth and served with crusty saffron aioli toast. To make the saffron aioli, use a mortar and pestle to mash the garlic and salt together until it forms a paste. If you do not have a mortar and pestle start by finely mincing the garlic. Sprinkle the garlic with the salt and then tilt the blade so that it forms a shallow angle with the cutting board. Scrape the knife across the garlic repeatedly, until it forms a paste. In a small bowl, combine the garlic paste, saffron, mayonnaise, and lemon juice. Cover and refrigerate until ready to use. Heat a large saucepan or pot over medium-high heat and add the olive oil. Add the garlic and saute until fragrant. Add the wine and simmer for a few minutes. Then add the tomatoes, basil stalks (reserve the leaves for later), fennel fronds, and fish stock. Simmer for 15-20 minutes until the liquid has reduced a bit, stirring occasionally and breaking up the tomatoes. While the liquid is simmering, give the mussels and clams a good wash in plenty of clean, cold eater and scrub any dirty one lightly with a scrubbing brush, pulling off any beardy bits. If there are any that aren't tightly closed, give them a sharp tap on the counter. If they don't close up, throw them away. After the liquid has simmered, turn off the heat, and puree using an immersion blender or carefully transfer to a standing blender and puree until smooth. If you like, you can strain the contents for a really smooth broth. Season with salt and pepper to taste. Reheat the liquid in the same pan and add the fish, largest pieces first. Then add the shrimp, clams, and mussels, pushing down the seafood into the liquid and put a lid on it. Cook gently over medium-low heat for about 5 minutes, or until all of the clams and mussels have opened up and the shrimp turns pink. (Discard any clams or mussels that don't open). To toast the bread, heat a pan over medium-high heat. Brush both sides of the bread with olive oil and place on the hot pan. Toast each side until golden-brown and crispy. Slather with the saffron aioli. Ladle the soup into bowls. Roughly chop a few basil leaves and garnish. Add a slice of saffron aioli toast to each bowl, serve with a lemon wedge, and enjoy! I’m trying to learn how to cook. My concern was making amazing meals not just something to bland. Thank you so much for this receipe. Hi Michelle! That’s great! Learning to cook and enjoying something wonderful that you have made is just the best! What is the weight of the fish for the recipe? Hi Kathy. Great question – I’ll update the recipe so that it’s more clear. Each fillet should be approximately 6 ounces. Hope you enjoy! Ooo.. I hope you give it a try. It’s great this time of year – warms you right up. Oh wow, that must have been amazing! Such a gorgeous location to enjoy it too! 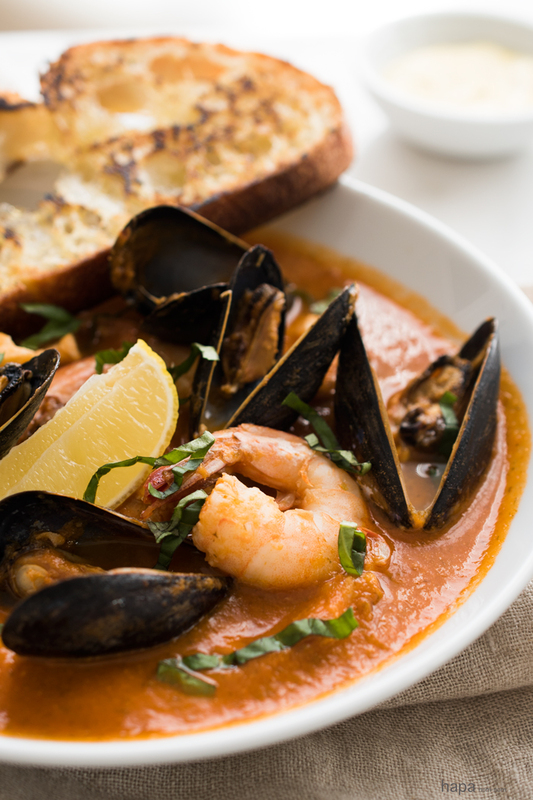 This bouillabaisse recipe is so special. I can’t wait to make it because you made it very easy. And the flavors are so great. Viva la France! Seafood soup, cioppino, bouillabaisse whatever it’s called and it’s on a menu I’m ordering it and now I’m making this at home. Lovely recipe. This is what I call comforting! I am looking forward to trying it next week! And with lots of bread and aioli! French food is amazing! I’m gonna try this bouillabaisse, since it is so easy! 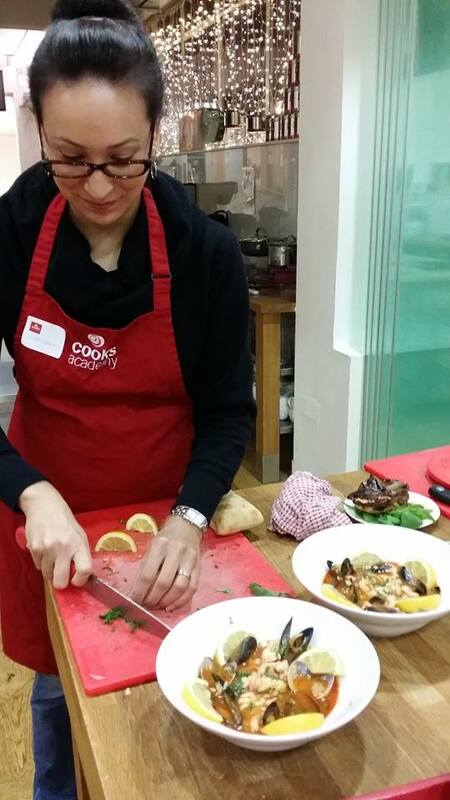 So glad you had a great time in Ireland and also took a cooking class! Oh my does this look amazing! I could go for a big bowl of this right now! I need to make this! Bouillabaisse is quite new to me. Love how vibrant, flavorful and delicious this is. Oh I think you’ll really like it, Anu. I hope you give it a try! Oh, I loooove Bouillabaisse! And believe it or not, I used to HATE “bivalves” when I was younger. Obviously I love them now, and your bouillabaisse looks beyond sensational, girlfriend! Your photos are gorgeous – the color alone is just beautiful! But all your ingredients has my tum-tum rumbling! I am totally craving a large bowl of this and a nice glass of wine! Perfect! Pinned! Cheers! I did too! Growing up we had a family tradition of going to the wharf after Thanksgiving and we’d get bags and bags of oysters and crabs. My uncle would spend all day shucking them and I would just look on in horror. But he’d always bribe me with a sip of his beer if I ate an oyster 😉 I grew to love them as I got older 🙂 Now I can’t get enough!